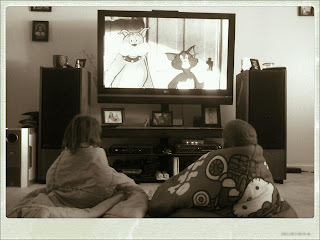 Haisley & Zach watching Tom & Jerry (this past summer). It's a gloriously crisp autumn holiday morning. Jeff has tooled off to work, the indoor (and outdoor) gangs have settled down for their first nap of the day. I managed to send off another 2 boxes (filled w/books) for the thrift store w/Jeff. It feels great to just get rid of them. Who'd have thunk? I have this serious emotional connection to my books and have always hated to part with them, apparently that phase is over. WE used to think as we came across books that we wanted to read, purchase them, place them in the library and we'll get to them. Then came the realization, that hey... we're getting older and by the time (we have time to sit and read) our eyesight will be shot and we'll never be able to lug the books off due to old age. That was aha moment as Oprah would say. And then there are miscellaneous things I've been saving for Dave and Amanda to give to them some day... well the same thought applies, with the added caveat, that they are not interested and are not going to want these items. So, over the next few weeks, Jeff and I will be clearing these off storage space in the many closets we have throughout the house, along with some artwork, etc. Zao Zing keepsakes, hello clutter free house. Kick starting my morning (in a few moments) with a cream cheese pastry, steaming cup of French roast while I hunker down to watch 2 episodes of The Good Wife that were recorded on to our DVR. Nathan Lane (whom I love) is this season's new addition. Last season it was Michael J. Fox. This afternoon I have a couple of boxes to sort through that Jeff placed on the patio terrace table for me to sort through. And, then I have reading on tap. Finished Robert B. Parker's High Profile, began Death In Paradise last evening. A low key day is what I have on my holiday schedule. Whatever it is you are doing, enjoy!